On Monday April 18th Morris dancers, Jacks in the Green, hobby horses, drummers and May Queens from around England will visit Parliament to persuade The Government that the May Day Bank Holiday should be not be moved to another date. The campaign started in Hastings where the May Day holiday is celebrated in style. 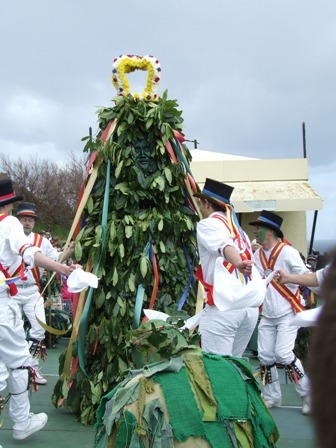 The traditional Jack in the Green is paraded around the streets with about 600 dancers, giants and other characters. The 19th century custom was revived when the Bank Holiday was introduced. Over the past thirty years it has grown to be one of the premier ‘must see’ events in England (top ten attractions in the Easyjet inflight magazine), and attracts visitors from around the world. The Bank Holiday also sees thousands of bikers descend on Hastings for the annual bikers rally. Over the weekend all hotels and restaurants in the town are full and the pubs usually run out of beer. Local businesses see it as a real boost after a long hard winter, and many say they would not survive without it. Together the two events bring about five million pounds into the local economy. Hastings is one of the most deprived towns in England; it is therefore no surprise that Hastings is fighting to keep the Bank Holiday, which for the town marks the start of the tourist season. The whole town has fallen in behind the campaign to keep the holiday and it has cross party support. The Labour Council and the Conservative MP Amber Rudd are working together to keep the holiday. Amber Rudd has hosted the petition to keep the May Day Bank holiday on her web site and will lead the petitioners when the petition is presented to The Minister. Hastings is not the only town that will be affected by any change in the bank holiday. 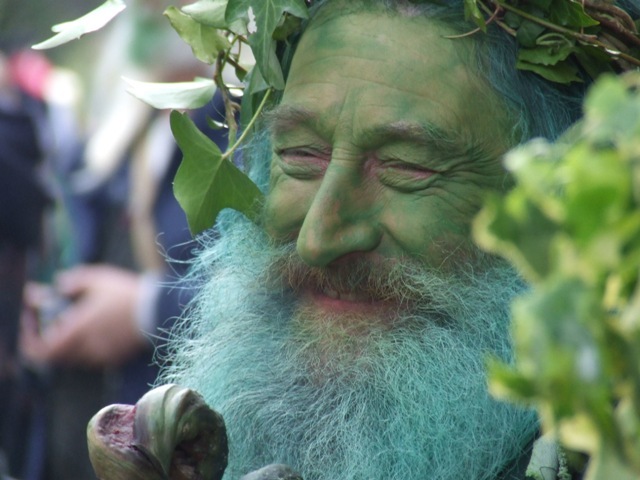 Many towns have used the holiday to put on similar events including Rochester, Bristol, Ilfracombe and Whitstable with Jack in the Green celebrations, each of these brings many millions into the economy of these towns. Upton upon Severn now has a folk festival, Knutsford has a weekend long May Day celebration and there are numerous other village May Queens and Maypoles across England. Representatives from Morris dance teams, Maypole dancers, May Queens and other May Day celebrations across England will be present at the rally. The Rochester and Deptford Jacks in the Green are expected to make an appearance. A Facebook group ‘We do not want to lose the May Day Bank holiday’ has over 15000 members. Campaigners point out that May Day is in fact one of the oldest public holidays in England, going back to the Romans, if not before. It has attached to it many customs and traditions that are part of English intangible cultural heritage. May Day was last abolished as a holiday by Oliver Cromwell’s Long Parliament, when he famously also abolished Christmas. It took 350 years for the holiday to be restored by Michael Foot. It is a celebration of the return of summer after the long months of winter. Workers have adopted it as a holiday because this metaphor could equally apply to the struggle of the working class through a ‘winter’ of exploitation; but the holiday is much older. The Campaigners consider the idea that moving the holiday to either October or St Georges Day to extend the holiday season to help ailing seaside towns such as Hastings to be spurious. St Georges day is only a week earlier, this would bring the holiday closer to Easter with all the subsequent problems this will cause. In October it is usually wet and cold meaning people will simply opt to travel abroad. The United Kingdom has the lowest number of Bank Holidays in Europe there is therefore a strong argument to have additional Bank Holidays to extend the tourist season rather than taking away a Bank Holiday that is already very successful in bringing much needed tourism to our struggling seaside towns. There is a UNESCO Convention designed to protect World Intangible Cultural Heritage events. Most nations of Europe are signatories; therefore their traditional customs are protected. It should be noted that the UK Government has not signed this convention. The very fact that they can even consider moving a Bank Holiday when many traditional customs happen coupled with the failure to sign the UNESCO Convention on Intangible Cultural Heritage shows that they have scant regard for the customs and traditions of England that deserve preservation for the future. This entry was posted on Apr 4, 2011 by Chris Walton. It was filed under Company Notices and was tagged with Jack in the Green, May Day, parliament. Please remember that this is a peaceful non party political event with the aim of persuading The Government to keep the May Day Bank holiday. We are not here to protest about anything else or to show our discontent with the government. We need to concentrate on the one issue of the May Day Bank Holiday, and do it peacefully with good humour; anything else could damage our case. From 1200-1300 we have the use of Old Palace Yard for the ‘demonstration’. This has had to be booked under SOCPA Designated Area regulations. We can morris dance, bang drums and wave placards only on this site and only between these times. I hope it goes without saying NO FIREWORKS. After this the petition will be delivered at 1400 to the DCMS. After the official end of the protest at 1300 we are all ordinary pedestrians (albeit in funny clothes) so please no more dancing, drum banging, placard waving. If you do so you could be arrested for having an unauthorised demonstration. If you want to witness the petition being handed in please make your own way peacefully to the DCMS, not as an organised group. There is no organised march so do not walk in the road. At the DCMS only four of us will go in. We will choose who on the day, but probably a representative from each town that has May Day events. Please remember we are NOT legally demonstrating at this point, no dancing, drum banging, shouting. The Police have stipulated that we must keep all pavements clear so that people can pass without stepping into the road. There will be marshals around to make sure this happens; if one of our marshals asks you to move to keep pavements clear please do so. If somebody is injured because you made them walk in the road you could be liable. After this as far as we are concerned it is over, if you want to go to a pub or other convenient place to morris dance that is entirely up to you, but no official permission has been sought, it will be between you and the authorities. We are NOT to dance or demonstrate in any way in Trafalgar Square. If you want to sign the petition to stop this government changing May Day please go to http://amberrudd.co.uk/?page_id=944&preview=true and fill in the form.